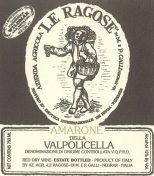 Terroir: Le Ragose Valpolicella is produced from estate vineyards sitting above 1200 feet in elevation. The vineyards are ideally situated with a south-west exposure and soils of clay and magnesium, calcium and iron based gravel. Vines average 30-60 years old. Vinification: The fruit is hand-picked and fermented in temperature-controlled stainless steel tanks with indigenous yeasts for 12-14 days, then re-fermented for 7 days in March on the lees of the Amarone using the ripasso method. The Amarone lees and skins contain sugars and re-fermentation absorbs about 10% of Amarone, giving the wine more aromatic complexity while maintaining Valpolicella’s lighter mouthfeel. For Superiore designation, the wine ages one year in steel, two years in 25-hectoliter Slavonian oak casks and refined in bottle for one year before release. The 2015 Valpolicella is light, brilliant ruby red in color with a bouquet of intense red fruits notes such as currant, strawberry and black cherry. On the palate the wine is medium in body but with a surprisingly enveloping mature berry flavor with hints of dried figs, coffee notes and cocoa powder. It is silky with sweet/tart fruit ripe fruit flavor dense, ripe and lush mature berries. Excellent with pasta dishes, roasted red and white meats (especially lamb and duck) gorgonzola cheese and radicchio dishes.